Even with email and digital communication, most business offices still use a lot of paper. Businesses can recycle office paper, magazines, cardboard and newspapers by working with a recycling vendor to collect these materials and divert them from the waste stream. If your company generates large volumes of cardboard, you may even receive revenues for this baled material. More than 80 companies exist in the paper recovery value chain that employs approximately 3,000 workers across the state. 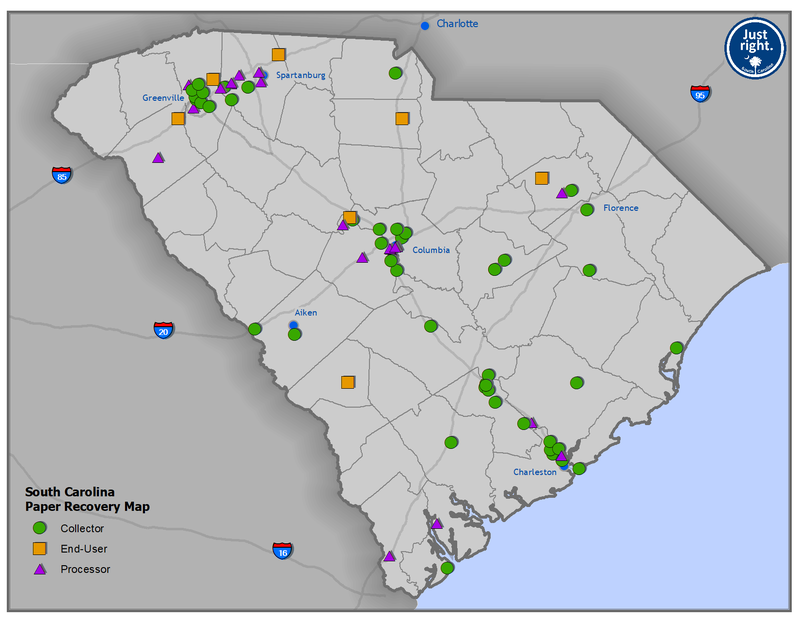 SC has a comprehensive network of recycling collectors, haulers, shredders, processors and mills for paper related material. These processing mills produce liner board, paperboard, tubes and cores (i.e., paper towel cores), game board and other packaging material for the consumer products industry. SC’s four paper mills use recycled Old Corrugated Cardboard (OCC) to make new paperboard and consume 1,261,000 tons of cardboard annually. Sonoco and WestRock are in the Pee Dee region, and Carotell Paperboard and KapStone are in the Upstate. Orchids Paper is a new tissue mill in Barnwell, SC with 130 employees and uses recycled pre-consumer paper to make tissue.